Somehow, many years ago, Kier worked his way onto the FL Studio alpha-testing team and since then we just can't get enough of his quirky videos, catchy music & infectious vocals. If you want to see one of Kier's projects for up close and personal look in the FL Studio (10 onward) Browser > Projects > Coolstuff > KieronAGore - The Light. I had a rubbish acoustic guitar, strings missing the lot as a kid, so I played the tennis racket far more. it wasn't until I turned 16 that I got interested and got myself a bass. A drummer friend for some unknown reason asked me to join a band with him (bredhed). Within four weeks of buying the guitar and joining the band I had my first gig. I was hooked. Me? a bass player in various bands playing original material of a fair few genres? well yep.... but, there was always an underlying want to write and someday sing. When the last band (gyroscape) finished I decided to have a go at writing my own music. I got a Boss eight track porta studio and started writing. Eventually the ear bleeding noise grew into a semblance of music. I quickly discovered I'd need more than the eight track so I brought my first PC. Having not used a computer since I was at school (pre-windows),I was in the deep end and drowning fast. I was passed a disk of 'free' software in about 98 and Logic and Fruity Loops were on it. I struggled with logic. The fruit however struck a chord. It's interface and workflow, everything seemed logical. So I went online and purchased it. In fact It was the first time I'd ever made an online payment. It wasn't until years down the line when I tried another DAW, I realised just how good FL was for me. I don't get into the whole war on DAWs. My knowledge is somewhat lacking in anything techie. But the fact that I can sketch an idea in seconds by far surpasses the need or want for any other platform. When all said and done FL is the underdog in the world of DAWs. 'Funny how a word can affect us' I still fondly refer to it as Fruity Loops. and no longer correct myself. Undoubtedly a rather sad confession but, as I've grown up with FL and have been around the community for a long time. I feel part of something. It's nothing mysterious or underground it's just something different, something I feel a kinship with. Kier has been a forum user name that's been around as long as I've been aware, though in the net world it came from the bloody Americans, so it stuck. 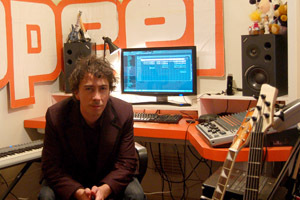 audiopeel is the name of the 'collective' of the music that I've performed under since 2004. By definition the name comes from....erm, say something cool. damn. ok so I work in layers to create songs. All the layers are purposeful and when placed together create the final audio blurge. So it seemed fitting to theme the name audiopeel (define audiopeel, define kier). audiopeel is a hub for what I do and what the band does. I see the songs that I have written as just that, songs. They're not stuck in a genre. I predominatly write with an acoustic but that's just the writing tool, the Alpha version I guess you'd call it. 'The Light' for example was written acoustically for the band, It took on the style that is in the FL version with the help of Nucleon. The lyrics are all about my personal experiences and are pretty much a tail of how crap my relationship abilities have been/are. I write from the heart and try to write intelligently. A lack of general grammar doesn't help but I do love words and I appreciate a good song writer. I strive to achieve a great song and the beauty is we always improve, well I'd like to think I do. We're never going to write our best song because it's at the end of the rainbow and often based in another persons perception. I've also created under different artist names. The most memorable being 'loggy and twig'. Deadmau5 even liked some of that stuff. Though the proof was on a comment in the old forums. The current setup I'm using is pretty minimal, I've experimented with hardware but due to moving home a fair bit I'm always down sizing. I've only just got a permanent backdrop. I'm using a 5 year old Dell pc. M-audio delta 1010 card, Behringer X2442 mixer, Fatar grand touch midi keyboard, Korg nano controller, Rode NT2 A, Rode NT1-A, TC Helicon voice live 2, Alesis MK2, Beyerdynamic DT 150 headphones and FL with some third party vst/vsti. For live I use a laptop (or a Dell desktop), Motu 828 MK2, M-audio oxygen keyboard. Acer touch screen and the Nano Control. It is live in the loosest sense of the term. only live playing and filter sweeping etc.